There are several common species of ranunculus found in UK and Ireland rivers and lakes. Ivy-leaved Crowfoot is one of the less common species, which although widespread, is very localised. 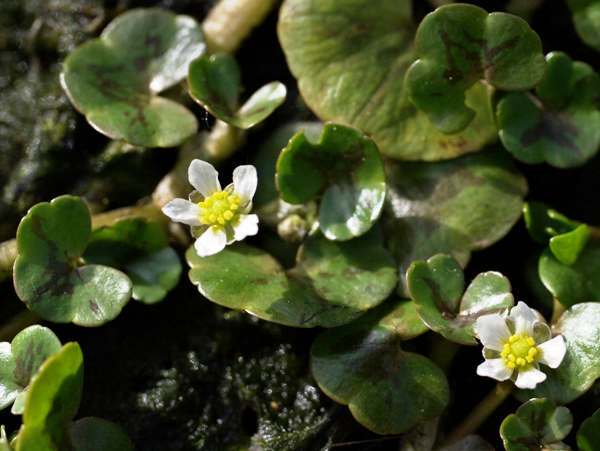 More commonly associated with bare muddy ground close to water rather than in streams, this is a difficult plant to distinguish from other similar-looking crowfoot since several of them also have ivy-shaped leaves. The fact that it is not actually in flowing water is a key factor. The flowers are small and have five petals with sepals that are almost the same length. The pictures on this page were taken at Nant Irfon National Nature Reserve, Wales, in late June.